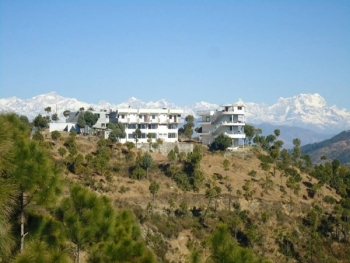 Swasteek The Himalayan Resort is located in Pauri-Devprayag road at an altitude of 6,000 feet above sea level, blessed by natural exquisiteness & surrounded by Pine forest. The green hills around and wonderful views of the extensive Himalayan snow ranges formulates a colorful and picturesque hill station. The place is Un-spoilt, healthy air and a magnificent view of the snow covered peaks inspire peace and tranquility. Swasteek Resort is away from the hustle bustle of your daily hectic city life, blessed with natures bounty like snow-capped Himalayan peaks & dense forests. Note: There are no malls, No video game parlors, No lucrative food joints, No instant maggie points, and not even a movie hall. But Swasteek Resort will offer you vacuum of silence, raw in nature, fresh dose of oxygen to activate the right side of your brain. 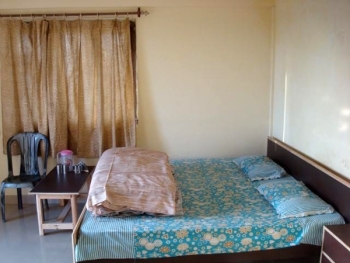 Hotel Swasteek is located between Pauri and Devprayag, approx 22 kms from Pauri and 15 kms from Devprayag. While staying in Swasteek Resort can visit some of famous nearby places like: Khirsu, Tehri, Rishikesh, Haridwar, Rajaji National Park, Neelkanth Mahadev, Lansdowne or take part in various adventure activities like Rafting in Ganges, Trekking, Hiking, Mountain Biking. The place where the Swasteek resort is located experiences a sub-temperate climate which remains pleasant throughout the year except during winters when it gets extremely cold. It receives snowfall during winters changing the place at its picturesque best. Each of rooms at Swasteek Himalayan Resort are bright, spacious and blessed with celestial views. From Valley View Rooms, guests can admire both sunrise & sunset over towering pine trees, while Himalayan View Rooms afford a magnificent harlequin sun rays falling over the Greater Himalayas. Each room is designed keeping in mind a high quality of sanity and hygiene. All rooms are with clean and good quality sanitary fittings in bathrooms with facility of geyser for 24 hours hot water supply & Bathtub in Panoramic Suite. Beds are beautifully dressed with cozy blankets to keep you warm during chilled nights. Each of the Superior rooms are having spacious balcony for you to enjoy the scenic beauty with your loved once & Junior suites with round porch to enjoy your morning tea & breakfast. The Swasteek resort also has a multi-cuisine restaurantt ‘YUMMY’, which offers delicous food to the guests. By Flight: Nearest Airport is Jollygrant Airport, Dehradun (117 kms). By Train: Nearest railway station is Rishikesh (100 kms), Haridwar (130 kms), Dehradun (140 kms), which is well connected with Delhi. By Road : The resort is well connected to Rishikesh, Haridwar, Dehradun by buses & tourist vehicles. Swasteek Resort is around 100 kms from Rishikesh which takes 2-3 hours journey. Road Route from Delhi: Meerut â€“ Haridwar â€“ Rishikesh and onwards to Paudi via Devprayag.